To keep today’s ultra-efficient heat exchanger systems operating at peak efficiency, petrochemical and refining facilities must clean their tubes thoroughly and regularly to keep them clear of process related deposits. Such deposits can drastically limit the system’s ability to transfer heat, driving operating costs substantially higher. Adding indirect costs like downtime and compliance with safety and environmental regulations, the pressure on tight operations budgets’ becomes intense. To meet this challenge, more and more companies today are cleaning tubes with Ultra high pressure (UHP) water jetting (20,000 to 40,000 psi, or 1,400 to 2,800 bar). Water jetting has been widely used for product removal and industrial cleaning for some 40 years. It removes hardened deposits thoroughly and cost-effectively, often saving thousands of dollars/rands/pounds while significantly improving productivity. Semi-automated systems, for example, can clean 100 tubes 75% faster than manual methods, depending on the size of the tube bundle and the material being cleaned out. Fully automated systems can clean them 90% faster than manual. A UHP tube cleaning system typically involves a small nozzle placed on the end of either a rigid tube (for straight line cleaning) or a small flexible hose (for tubes with bends). 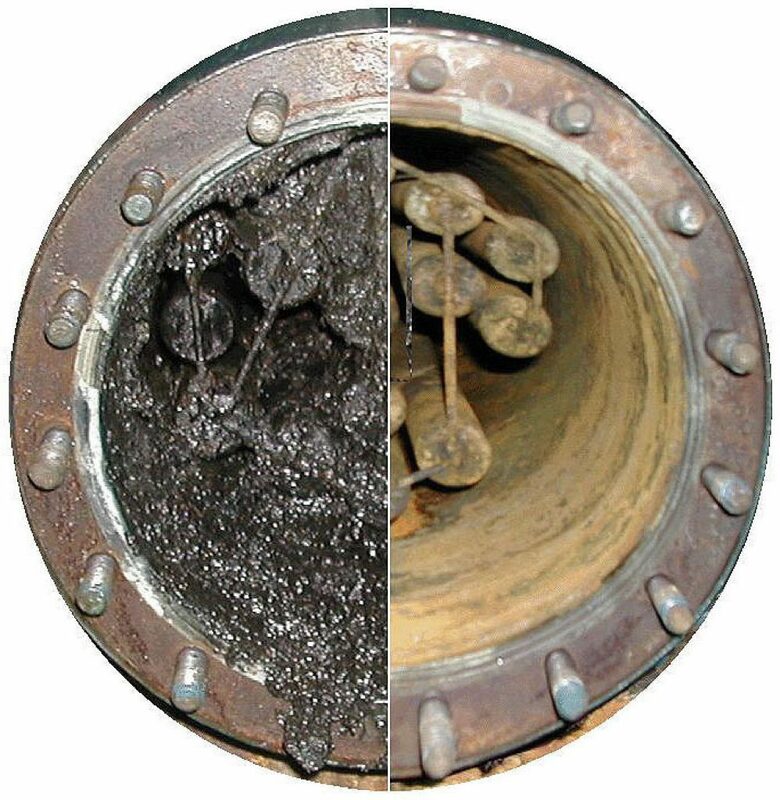 Water from a pump unit is fed through the tube or hose and exits the nozzle at a speed and pressure that removes even the hardest residues, rust and scale. The waste material is then flushed out of the tubes and rinsed away. One of the most common and most economical methods for cleaning tubes is manual water blasting. There are a number of variations on this, but all generally require an operator to manually feed the nozzle into each tube that needs to be cleaned. Once the nozzle is positioned in the tube, the operator starts the flow of high‐pressure water by depressing a foot pedal. This process, while effective, has drawbacks. First, it can be time-consuming. Second, holding on to a hose as highpressure water rushes through can lead to operator fatigue over time. Third, the operator may not always feed the nozzle into the tube at the same speed, which can result in uneven cleaning. Automated systems are a superior method for removing product build‐up from heat transfer tubes. Not only do they save many hours compared to manual methods, but more importantly they eliminate the variables an operator brings to the process while removing him or her from the immediate vicinity of the high-pressure water. Automated systems for cleaning tubes typically have multiple lances or hoses, a means of moving them across the face of the tube bundle, and a system for feeding them in and out of the tubes without manual labour. The operator typically controls the actions of the system from a remote position nearby. Hoses and lances are usually provided in different sizes to suit a variety of tube diameters; changeover should be simple to minimize downtime. The Jetch model HE-30/40 heat exchange cleaning system is engineered to clean and unclog heat exchanger tubes and pipe in a semi-automated process. after inital setup, the system requires only one operator who can control the rotation of the lances and the in/out motion of the lances for cleaning the remote operators station. Optional 2,3 or 4 rotating lances. Swing type level unit at rear of system to control level position the lance track unit.